INNHM is a non-profit agency providing food to needy children in Brazil, specifically in Contagem and Natal. We will be working with families / children to deal with social issues. However, our main goal is to maintain the family unit to prevent children from being sent out to live on the streets at a very young age. We will be focusing on children of ages 2 to 16 in low income families where the family is unable to provide food for all the children. Studies have shown that these are the children with the highest risk of being sent to live on the street. INNHM will form partnerships with local churches, government organizations and other non-profit organizations to provide food and other assistance to low income families. In Natal, we are working with an orphanage called Lily of the Valley. 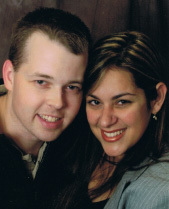 Duane Gill was born and raised in Edmonton, Alberta and met his Brazilian wife Jeanne on a missions trip in 1995. They were married in 1999. Duane worked for years in the construction trades and printing industry. Jeanne is a Certified English as a Second Language teacher. Duane and Jeanne now run a full time ministry in Brazil and have three children.